J/News Articles: Fast Newport to Ensenada Race! (Newport Beach, CA)- The annual Newport to Ensenada Race had one of its fastest races ever, especially for the “big boats”. The race is a ritualistic dance for much of the southern California offshore racing community. It has evolved over time to accommodate more sailing enthusiasts. 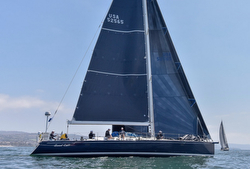 Today, it provided the 193 boats entered three choices: the “classic” Newport to Ensenada race of 125nm, the Newport to San Diego race of 75nm, and the Newport to Dana Point race of just 15nm. What is the attraction of this fabled offshore race down the Pacific coastline from California to Mexico? Perhaps, it was best captured by a story from Mike Lawler, a boat captain that lives on Balboa Island. Here are some snippets from his story for the Los Angeles Times (http://www.latimes.com/socal/daily-pilot/opinion/tn-dpt-me-commentary-n2e-20180424-story.html). “Experience, of course, is valued, but working well together as a crew is essential. On our boat, several of the crew have been racing together for decades, which is a huge advantage. This will be my 16th N2E race on Amante. It's also about the camaraderie through shared experiences on the water with other sailors. Both before and after the race, it's fun to have a beer with a fellow sailor, sharing stories about their boats and the race, what went right and what went wrong. It's about the start. It is thrilling to see so many racing sailboats circling for position in racing sequence just before their start. It is even more of an adrenaline rush to be on one of the boats, doing your best as part of a crew to get a good start, with your competitors all around you, and then hear that starting gun go off! It's about the breeze. Sometimes we have good breeze all through the night, but that's rare. Usually, on this race the wind eases up after the sun sets, with light air racing through the night, just trying your best to keep the boat moving. Every few years we have a fresh breeze of 15 to 20 knots from the northwest throughout the night, which means an early Saturday morning finish. It's about the course. From the starting line off the Balboa Pier to the breakwater off the Hotel Coral Marina in Ensenada is 125 nautical miles. Along the way are the Coronado Islands, and the skipper must choose to go either outside or inside those islands. Usually there is more breeze outside the islands, but sometimes an offshore breeze fills in after midnight and the inshore track may be more favored. Other years, sailing the rhumb line directly to the finish, and thereby sailing fewer miles, works best. It's also about the adventure. Sailing offshore at night is always exciting, and at times challenging. This year, we will have the benefit of a near full moon. It's about the finish. Often, several boats are converging from different directions, some sailing deep right for the line, and others reaching in at hotter angles. One time we had heavy traffic with about 20 boats bunched together and finishing within a minute of each other. It can be dramatic, at times chaotic, and always exhausting, after racing for 20 to 24 hours or so with little or no sleep. Friday was the start of the 2018 N2E, which is actually several starts 10 minutes apart, with two side-by-side starting lines, beginning at 11:00am just off the Balboa Pier. In the end, several J/crews managed to collect more silverware for their trophy rooms; here are some of the highlights. 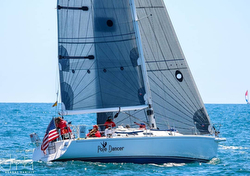 In the PHRF E class of ten boats, the J/92 DOUBLE DOWN sailed by Brian Kerr took 1st in class! Not far behind was the J/105 ROCINANTE skippered by Juan Lois, pulling off a 5th in class. 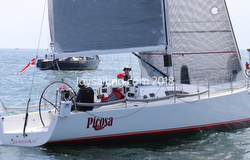 The fourteen-boat PHRF B class saw Doug Jorgensen’s J/111 PICOSA take 4th, missing the podium by a mere 34 seconds! Finally, in the “big boat” PHRF A class of eleven-boats, it was the mighty J/65 GOOD CALL, skippered by her owner Tom Barker, that took home the bronze! In the “medium distance” the Newport to San Diego race, taking second in PHRF A class was Seth Hall’s J/124 MARISOL. 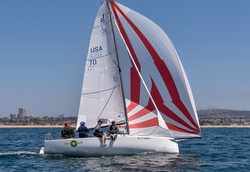 Then, in the “little boat” Newport to Dana Point race, a number of J/crews scored well! In the PHRF Spin Division, it was a near clean sweep. The Jock McGraw’s J/22 TEKEELA won the class of eleven boats, followed in second place by Tom Garret’s J/70 SLOOP JOHN B, and by Charles Brewer’s J/124 HEARTBEAT 4 in 5th place. Sailing photo credits: Joy Sailing / Bronny Daniels and Tom Walker Photography For more Newport to Ensenada Race sailing information Add to Flipboard Magazine.